After closing out the Metropolitan Opera’s 2015-16 season in La bohème, Bryan Hymel returns to the Opéra National de Paris for Verdi’s La traviata, performing the role of Alfredo from May 20 to June 14. Conducted by Michele Mariotti and directed by Benoît Jacquot, the production also stars Sonya Yoncheva as Violetta, Antoinette Dennefeld as Flora, Elisabeth Moussous as Annina, and Željko Lučić and Simone Piazzola alternating the role of Giorgio. 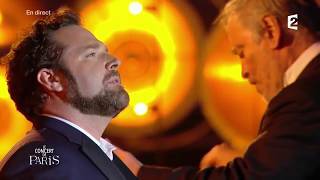 The American tenor performed at the Opéra National de Paris earlier in the season in Berlioz’s La Damnation de Faust, singing the title role alongside Bryan Terfel and Sophie Koch. The American tenor sings at the Metropolitan Opera on April 15, 21, 25, 29, and May 5 under the baton of Dan Ettinger alongside Maria Agresta as Mimí and Ailyn Pérez as Musetta.